While Viagra makes men's hanging cavernous tissue hard, scientists at the Ruhr Universitat in Bochum, Germany, have now discovered that it can save lives too by causing the opposite effect: Viagra makes some heart muscles less stiff. Professor Wolfgang Linke and his team have found that Viagra activates an enzyme that causes protein in heart muscle cells to relax and become more flexible. 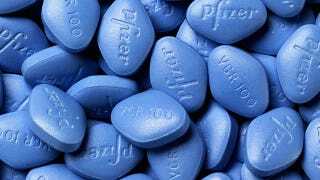 Ironically, before becoming a drug to promote erections, the blue pill's original purpose was to treat high blood pressure and other kinds of heart disease. It failed to achieve this objective, but the side effects below the waist proved extremely convenient for millions of penises worldwide and Pfizer's bank accounts. This newly discovered benefit can help patients with diastolic heart failure. This illness makes heart ventricles abnormally inflexible. As a result, they don't fill with enough blood. Apparently, the drug helps this condition almost instantly. This discovery would also finally make true that old saying: "do you have diastolic heart failure or are you just happy to see me?"